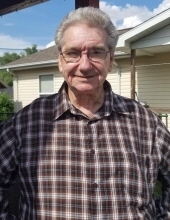 Harold Oliver, age 71, of Brownsfork, KY passed away on March 17, 2019 at his residence. Harold was a United States Army Veteran, retired Nutritionist for the VA Hospital in Dayton, OH and a member of the Hazard Village Church of Christ. He was born on December 26, 1947 to the late Golden Oliver and the late Lucy Melton Oliver. He is also preceded in death by his wife: Jeanie Holland Oliver; one daughter: Melinda Sue Littleton; two grandson: Joshua & Sean and one brother: James Oliver. He is survived by one sister: Shirley Lawson of Brownsfork, KY; one brother: Earl Oliver of Jeff, KY and a host of nieces, nephews, family & friends. To send flowers or a remembrance gift to the family of Harold Oliver, please visit our Tribute Store. "Email Address" would like to share the life celebration of Harold Oliver. Click on the "link" to go to share a favorite memory or leave a condolence message for the family.